Wallace George Lowe got interested in cameras as a child in Hastings. As a climber he was pivotal in helping his mate Hillary summit Everest, and he filmed the mission after the official photographer got pneumonia. 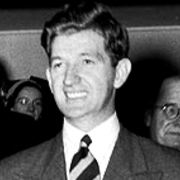 The Lowe-directed doco The Conquest of Everest, was nominated for an Academy Award in 1954; the film he directed on the first trans-Antarctic crossing was also Oscar-nominated. 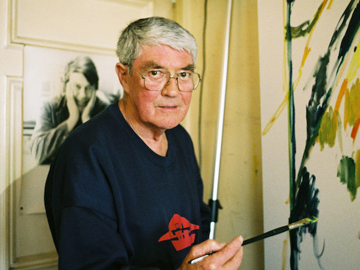 Lowe died on 20 March 2013. 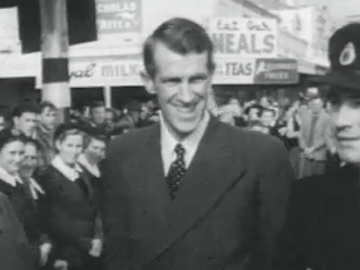 In this 1956 reel, Sir Edmund Hillary and colleagues describe their mission to set up bases in advance of the Commonwealth Trans-Antarctic Expedition. Ed meets Everest mate George Lowe in Uruguay to board The Theron, and they smash and use explosives to blast their way through ice, then unload supplies (including the soon-to-be-famous Ferguson tractors). Sections of the footage were shot on 16mm film by Hillary himself. Lt Commander Bill Smith and Dr Trevor Hatherton narrate pathfinding with sledges in McMurdo Sound, on the other side of the continent. Journalist Mark Sainsbury accompanies Sir Edmund Hillary on a "testimonial trek" to Nepal. This segment was the first of three that screened on Holmes in April 1991. Sir Ed travels to Tenboche Monastery, meets son Peter and fellow climber George Lowe, recalls his famous climb and reconnects with the sherpas who call him Barrah Sahib: the Big Man. En route Sir Ed gets altitude sickness and needs oxygen. He comments on the risks of returning to Everest: "I have the alternative of lolling on a sun-drenched beach [...] something I find exceptionally boring". 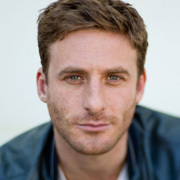 Dean O’Gorman starred in his first feature film (Bonjour Timothy) aged only 17, and has since had leading roles in another four, including the 2017 remake of Goodbye Pork Pie, plus a part in The Hobbit. His television work ranges from playing a modern-day God in The Almighty Johnsons, to award-nominated turns in satire Serial Killers and Australia’s McLeod’s Daughters.